WIND was the earliest, next to wood burning, operated by human renewable energy source. Wind is the movement of air caused by the difference in density of heated air masses and their upward movement. The negative pressure created in this way causes suction of cold air masses. Wind energy is an energy of solar origin. The air is heated by solar radiation and convection, or heat conduction. Earth’s rotational movement and sea currents also influence the directions of air masses. About 2% of the energy of solar radiation, reaching the surface of the Earth, changes to the kinetic energy of the wind. Modern wind power plants are structurally very similar to each other. In general, they have a three-lobes rotor, less often a biplane, mounted on a hub on a horizontal shaft. The shaft is mounted in bearings in a steel gondola or made of plastic. The gondola with the rotor is installed on a tubular tower, the height of which, depending on the wind conditions, varies from 40 to 100 meters. The rotor with the gondola is set in the direction of the wind using the servo-controlled mechanism of the power plant located inside the tubular tower. 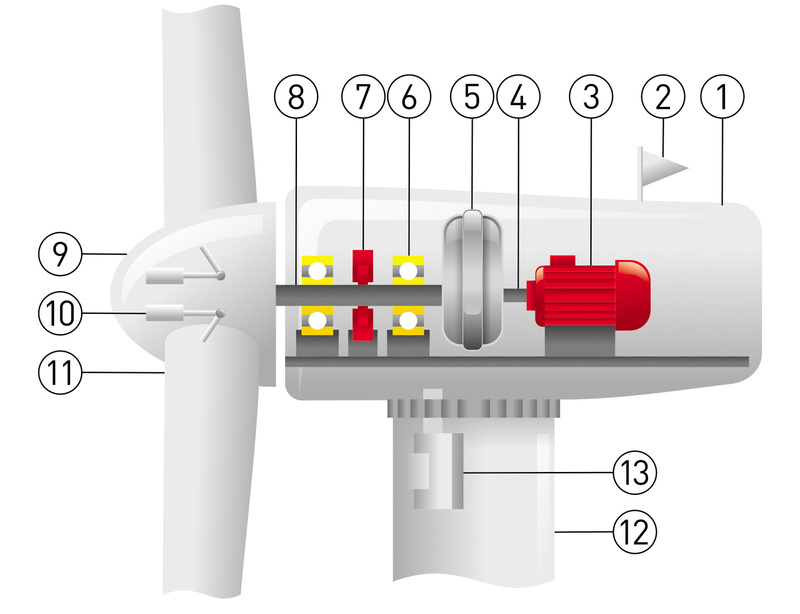 The air flow affecting the rotor blades rotates it along with the shaft, which via the gearbox moves the generator, producing electricity.